If you went to an urgent care center for every mysterious rash that you have, you’d probably be spending more time in the waiting room than in your living room. While many rashes don’t mean much more than you came in contact with something that irritated your skin, there are some rashes that deserve a doctor’s medical care. 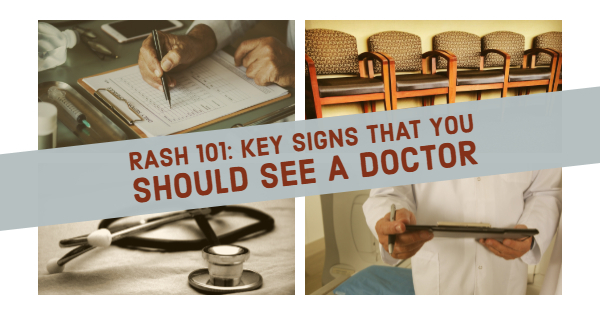 Know these key signs that you should seek treatment from a medical professional for a rash and you won’t waste your time with unnecessary trips to the emergency room. When your rash doesn’t clear up in a reasonable span of time, it can be a sign of infection. The rash likely started as benign, but it is possible for a secondary infection to develop. Infected rashes often present symptoms including fever, unusual warmth in the area, a foul order, pain, and a yellow or green discharge that appears cloudy. There are some instances in which it is normal for a rash to blister. If you’ve recently come in contact with poison ivy, you can put your worries to rest. Poison ivy, oak, and sumac all contain an oil known as urushiol that causes an itchy rash that turns into painful blisters. If you haven’t come into contact with any of these poisonous plants within the last couple of weeks and you have a mysterious rash starting to blister, you should see a doctor as soon as possible. When your rash isn’t limited to one area of your body but is instead covering a large stretch of skin, the rash is likely a sign of a major allergic reaction. If you have no idea what caused this reaction, it is important to visit your doctor right away. Tell them of any changes you’ve made in the last two weeks, such as starting a new medication. A rash in an unusual shape can also be an indication of a more serious problem. If your rash is in a circular shape, consider whether you live in or have recently visited an area prone to Lyme disease. If so, you should go to an urgent care as soon as possible to determine whether you’ve contracted the disease. With about 7,357 urgent care centers in the United States, you can easily find a facility in your area. When something seems amiss with your health, don’t hesitate to make a visit to one of these facilities. Giving your body the attention it needs is the best way to stay in good health for decades to come.